The Buddy Lee jump rope is the latest in high-tech home fitness equipment to help you burn belly fat. This cutting edge technology jump rope will definitely help your home fitness fat loss program. 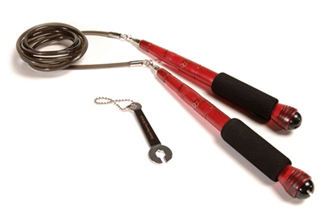 The Buddy Lee Rope Master Jump Rope is becoming increasing popular as a significant piece of home fitness equipment. The benefits of jumping rope are well-documented. Consistent and progressive fat loss, increased stamina, increased lean muscle development, improved coordination and agility, and strengthening of the entire cardio-pulmonary system cover most of the bases for optimal fitness. * No drag or tangling. * This high-tech rope is adjustable for people 6'9" and under. * It comes with a special swivel-bearing wrench that is designed to secure and replace the advanced swivel-bearings. The Buddy Lee Rope Master Jump Rope is quickly becoming strong competition for the Everlast Leather Weighted Jump Rope as the best on the market. If you are looking for a critical piece of home workout equipment, this innovative, high-tech jump rope by Olympian Buddy Lee is worthy of strong consideration.